encircling in the manner of a crown; said of anatomical structures such as vessels, ligaments, or nerves. coronary arteries two large arteries that branch from the ascending aorta and supply all of the heart muscle with blood (see also table of arteries). A view of the coronary arterial system. The arteries serving the posterior aspect of the myocardium are shown here in a lighter shade. coronary artery disease (CAD) atherosclerosis of the coronary arteries, which may cause angina pectoris, myocardial infarction, and sudden death. Both genetically determined and avoidable risk factors contribute to the disease; they include hypercholesterolemia, hypertension, smoking, diabetes mellitus, and low levels of high density lipoproteins (HDL). coronary heart disease (CHD) ischemic heart disease. coronary occlusion the occlusion, or closing off, of a coronary artery, usually caused by a narrowing of the lumen of the blood vessels by the plaques of atherosclerosis. Sometimes a plaque may rupture and release vasoactive or thrombogenic substances that lead to clot formation. If there is adequate collateral circulation to the heart muscle at the time of the occlusion, there may be little or no damage to the myocardial cells. When occlusion is complete, however, with no blood being supplied to an area of the myocardium, myocardial infarction results. (kōr'o-nār-ē), Do not confuse this word with coronal or coronoid. 1. Relating to or resembling a crown. 2. denoting various anatomic structures, for example, nerves, blood vessels, ligaments. 3. Specifically, denoting the coronary blood vessels of the heart and, colloquially, coronary thrombosis. /cor·o·nary/ (kor´ŏ-nar″e) encircling like a crown; applied to vessels, ligaments, etc., especially to the arteries of the heart, and to pathologic involvement of them. 1. Of, relating to, or being the coronary arteries or coronary veins. 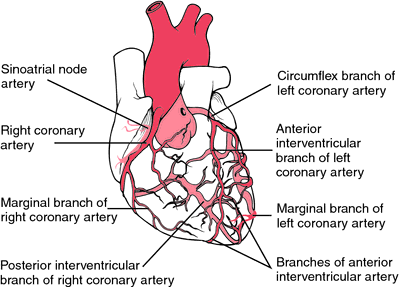 1 adj, pertaining to encircling structures, such as the coronary arteries. 2 adj, pertaining to the heart. a myocardial infarction or occlusion. adjective Referring to the blood vessels, nerves, and ligaments related of the myocardium. noun A commonly used “short form” for an acute myocardial infarction, as in “Richard had a coronary last month”. adjective Referring to the blood vessels, nerves, and ligaments related of the myocardium noun A popular term for an acute MI. See Café coronary, Coital coronary. 2. Encircling; denoting various anatomic structures, e.g., nerves, blood vessels, ligaments. 3. Specifically, denoting the coronary blood vessels of the heart; colloquially, myocardial infarction or coronary thrombosis. Pertaining to a crown. The CORONARY ARTERIES arise from the main artery of the body immediately above the heart, and give off branches which spread like a crown, over the surface of the heart. encircling in the manner of a crown. 1. a term applied to vessels, ligaments, nerves, the band at the skin-hoof junction. 2. blood vessels partially encircling the heart. two large arteries that branch from the ascending aorta and supply all of the heart muscle with blood. See also Table 9.
one or both arteries originate from the pulmonary artery instead of the aorta; anoxia of the myocardium leads to congestive heart failure. in foals during a difficult parturition and in cattle due to penetration by a reticular foreign body; sudden death due to cardiac tamponade. can result from perforation by a foreign body from the reticulum as part of the syndrome of traumatic reticular pericarditis. Cardiac tamponade results, causing acute or congestive heart failure. the junction of the skin and the horn of the hoof. intravenous injection of chemicals such as veratridine causes cardiac slowing, hypotension and apnea due to reflex response by the myocardium. Called also Bezold-Jarisch reflex. the spongy, resilient hypodermis beneath the coronary corium of the hoof. lodgment of an embolus in a coronary artery is a rare occurrence in animals. Myocardial ischemia and asthenia result, the effect on the animal varying with the amount of muscle compromised. the occlusion, or closing off, of a coronary artery. The occlusion may result from formation of a clot (thrombosis). Narrowing of the lumen of the blood vessels by the plaques of atherosclerosis, as occurs in humans, does not occur in animals. If there is adequate collateral circulation to the heart muscle at the time of the occlusion, there may be little or no damage to the myocardial cells. When occlusion is complete, however, with no blood being supplied to an area of the myocardium, myocardial infarction results. the difference between aortic diastolic and right atrial diastolic pressure; a determinant of the blood flow to cardiac muscle. formation of a clot in a coronary artery. See also myocardial infarction.